The International Olympic Committee (IOC) has elected eight new Members as well as a new Vice-President and three new Members of its Executive Board during the IOC Session in Lima on September 15, 2017. Ms Anita L. DeFrantz (USA), who joined the IOC in 1985, was elected as an IOC Vice-President. She already occupied this position from 1997 to 2001. Dr Robin E. Mitchell, IOC member in Fiji, Mrs Nicole Hoevertsz, IOC member in Aruba, and Mr Denis Oswald, IOC member in Switzerland, were chosen by the Session to join the IOC Executive Board. They will serve a four-year term. Earlier in the day, the IOC Session elected eight new Members, who were proposed by the Executive Board in August. Four members, three of them women, were elected in the category of Individual Members: Baklai Temengil (PLW); Kristin Kloster Aasen (NOR); Khunying Patama Leeswadtrakul (THA); and Luis Mejia Oviedo (DOM). 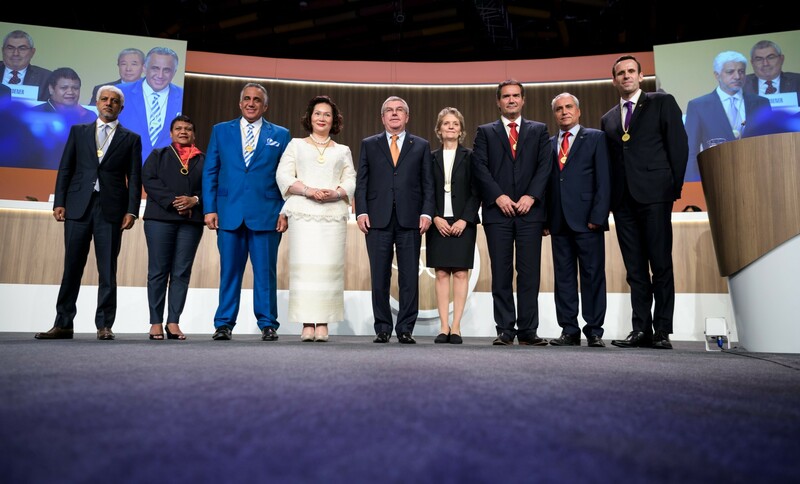 President of the Pan-American Sports Organisation (PASO) Neven Ivan Ilic Alvarez (CHI) and President of the Oman Olympic Committee Khalid Muhammad Al Zubair were elected as representatives of a National Olympic Committee (NOC) or continental association of NOCs. President of World Rowing Jean-Christophe Rolland (FRA) and President of the International Equestrian Federation (FEI) Ingmar de Vos (BEL) were elected as Members representing an International Federation. Sixteen Members were subject to re-election after eight years of membership, and were re-elected en bloc: Franco Carraro (ITA); John Coates (AUS); Crown Prince Frederik of Denmark (DEN); Iván Dibós (PER); Habu Gumel (NIG); Ser Miang Ng (SGP); Lydia Nsekera (BDI) Richard Peterkin (LCA); Richard W. Pound (CAN); Princess Nora of Liechtenstein (LIE); Craig Reedie (GBR); Juan Antonio Samaranch (ESP); Pál Schmitt (HUN); Austin L. Sealy (BAR); Sheikh Ahmad Al-Fahad Al-Sabah (KUW); and Shamil Tarpischev (RUS). In addition to being re-elected, Mr Coates got his status changed from member representing an NOC to Individual Member. In light of the upcoming Olympic Games Tokyo 2020 and Mr Tsunekazu Takeda’s important role in their preparations, the IOC Session agreed to extend the age limit for Mr Takeda, the President of the NOC of Japan, until the end of the Olympic Games Tokyo 2020.